There were four friends; a deer, a crow, a tortoise and a rat. They were happily spending their life. One day, a hunter laid a trap to catch the deer. The deer was caught in the trap; in no time. When the other friends saw him trapped, they made a plan to rescue the deer. 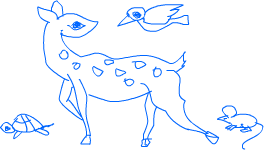 As per the plan, the deer first showed as if it was writhing in great pain. After that, the deer lay down and popped its eyes as if it was dead. The crow starting poking into the deer’s eyes. Crows and other scavenger birds do this to dead animals. Then the turtle started moving in front of the hunter. The hunter thought that the deer was dead and hence he need not worry about the escape of the deer. He thought of catching the turtle as a bonus. While the hunter was busy chasing the turtle, the rat cut the ropes of the trap and thus the deer was set free. The deer ran away. After that, the crow picked up the turtle and fled away. Thus, all the friends saved the deer.